We believe the solution for patients, doctors, nurses, and all allied healthcare professionals is Treatment Scores™, which are produced by analyzing the science of medicine behind medical treatments. This type of quantification has never been done in medicine before. The clinical decision-making process has always been considered too complex. It's like the early days of the computer when only people who knew machine programming language could use a computer. Then, Apple and Windows came along and put on a graphical user interface and suddenly everyone could use a computer! 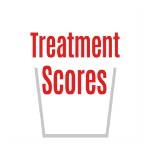 That's basically what we at Treatment Scores, Inc. are doing. We are putting a graphical user interface on the treatment decision-making process. Using our Treatment Score Analyzer™ creates quantified transparency in healthcare for the first time in medical history. We also quantify treatments for you, and with you, using evidence-based medicine algorithms to create both Treatment Scores™ and Treatment Grades™. You will be able to decide for yourself if a treatment is grade A or grade F.
A – The best treatments that are supported by randomized controlled studies. E – It is shocking how many treatments in medicine today are actually Grade E, the worst in terms of having any positive effect at all. Grade F treatments are considered harmful. An example would be the frontal lobotomy being done for depression. Using our Treatment Score Analyzer™, which puts a graphical user interface on the clinical decision-making process, everyone is able to see the science of medicine behind medical treatments. We claim zero percent accuracy. We provide organizational and informational tools only. As a new technology, we claim zero percent accuracy for Treatment Scores™, Treatment Grades™, and SOM® scores. We do not recommend any treatments, medications, devices, or other healthcare products. We do not recommend any physicians or other healthcare providers. See your own licensed physician, or other qualified healthcare professional, before undergoing any treatment. It is our intention to provide tools for learning, but we do not form doctor-patient relationships, recommend treatments, suggest treatments for you, or treat patients in any way. See our full disclaimer linked to at the top of the website page.